If you’ve received an email from Gardeners’ Guild in the last few months you might have noticed our logo has changed from blue to gold and says “celebrating 40 years”. Forty years is a milestone for us. We are so proud. Our story is inspiring. It is not only our number of years in business but what Gardeners’ Guild has achieved during those years. 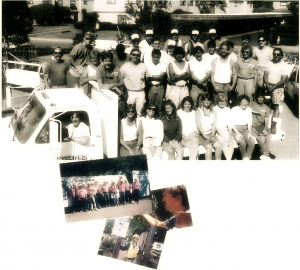 From humble beginnings: a handful of people working out of the Circle V Ranch in West Marin to our corporate headquarters in Richmond and 135 employees later – it has been a fantastic journey and a different kind of business success story. It goes beyond what is traditionally thought of as corporate success; bottom line profit. Our success can provide a lesson for any business today. In an era rife with news reports of corporate greed and corruption Gardeners’ Guild illustrates that a company that “grows” and nurtures its people – with employment that includes full benefits, training; empowers them with a stake in ownership, has a commitment to preserving our environment, serves its community – is a role model for all. Rewind to 1972. Alan Weiss and Adam Blackwelder founded Gardeners’ Guild of Marin. Their small operation provided residential landscaping services to homes in the county. Enter Linda Novy. In 1975 she was working in San Francisco and through a fortuitous introduction, accepted an offer to work at Gardeners’ Guild. By 1980 she was its sole owner. Through her vision, passion and guidance, Gardeners’ Guild grew into the innovative and widely respected landscape management firm that it is today. It was not easy. Linda readily admits that her management training was “trial by fire”. ”. Nonetheless she was fearless. She had great instincts; a gift for creating and nurturing relationships and strategic alliances with industry mentors. Linda was determined to expand into the more lucrative San Francisco commercial building market. She soon got her state contractor’s license and business began to grow. Gardeners’ Guild wrote a business plan; the company began implementing new systems that enabled it to run more efficiently. Gardeners’ Guild was developing a loyal client base. The company had finally penetrated the San Francisco market and was successfully selling its interior and exterior maintenance services. At this point Gardeners’ Guild was sort of a generalist in terms of its services that included maintenance, enhancements and irrigation. That would soon change. This was the late 70’s. Having a green lawn was still part of the American Dream. Keeping that lawn green required a lot of water and chemical or synthetic products. Then without warning the bay area endured one of the worst droughts of record and it lasted for two years. During the second year of the drought the Marin Municipal Water District (MMWD) instituted very stringent water rationing. Linda pondered the potential of a serious long term water shortage and this became a turning point for Gardeners’ Guild. I really appreciate reading Part One of your blog related to celebrating our 40th Anniversary at Gardeners’ Guild. I feel very fortunate to be part of that continuing legacy and for having the opportunity to work with such a great group of people over the many years that’s I’ve worked at the “Guild”. Look froward to reading Part Two of your continuing blog.